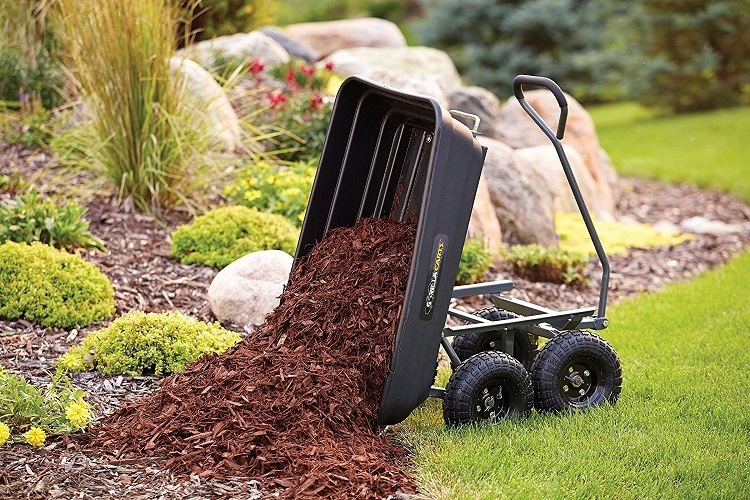 If you need to haul bags of mulch or compost, move pot plants around, or any other chores in your garden involving moving heavy objects, give your back a rest & invest in a lawn cart. 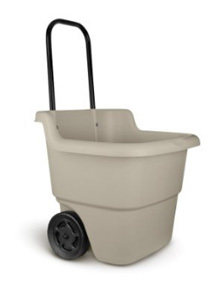 Smaller & more versatile than a wheelbarrow, the carts come in various sizes and capabilities. After many hours of in-depth research & discussion with gardening experts and home users, we believe the Gorilla Carts GOR4PS is the best lawn cart for most situations. This is a new model replacing the GOR200B, which was our previous pick. Though it’s not expensive, it’s not the cheapest cart available, but its 600lb load capacity, sturdy construction, manoeuvrability and dump feature make it our winner. The Gorilla Carts GOR4PS is our choice as the best lawn cart. It has everything most people need in a lawn cart, at a reasonable price. It’s sturdy, manoeuvrable, and can handle loads of up to 600lb. The body is plastic, with a steel frame. The cart also has a tipping function, to save you from having to shovel loads of compost, mulch etc. out of the cart. How heavy will the biggest load be? Should I go for 2 wheels or 4? ​Do I need a dump function? ​Is it worth buying a collapsible or foldable cart? Will I need to carry unusually-shaped or -sized loads? The heaviest load you expect to carry will dictate which cart you buy. 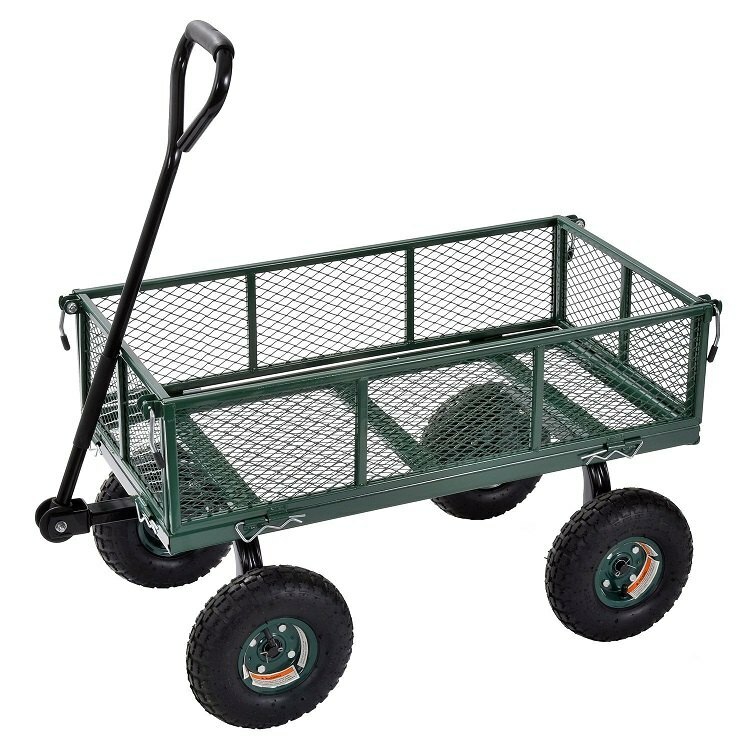 There is no point in spending the extra money (and putting up with the extra size and weight) of a lawn cart with 1200lb capacity, if the biggest load you expect to ever move is 100lb. Similarly, if you only expect to carry light loads, 2 wheels (or a wheelbarrow) may be the best option for you. If you want the ability to move heavier loads, buy a 4-wheeled cart, and let the cart take all of the strain – your back will thank you! The dump function found in the Gorilla carts and some others can be very useful if you’re moving soil, compost, sand etc. – it saves you from shovelling the load out where you want it to go. If you want to take your cart to the beach, grocery shopping, to picnics, sporting events, festivals etc, it could be worth buying a collapsible cart such as the Blue Mac. These carts fold away to a small size when required, so they can go in the trunk, and don’t take up too much space when you get to your destination. The trade-off with these carts is they don’t have anything close to the carrying capacity or sturdiness of the traditional, solid lawn carts. If you need the ability to carry unusually-shaped loads, a lawn cart with drop-down sides that converts to a flat bed, such as the Sandusky Lee CW3418 may be your best choice. The Go﻿﻿rilla Carts’ GOR4PS is, overall, the best lawn cart we have seen on the market. We believe it has everything most people will ever need in a lawn cart, at a reasonable price. Our previous choice was the GOR200B. This was similar to the new model, and may still be available from some outlets, however the new model addresses one of the main criticisms of the older model – some people found assembly to be time-consuming and tedious. The GOR4PS has been designed to be easier to assemble – you should be up and running within about 30 minutes of opening the packaging. 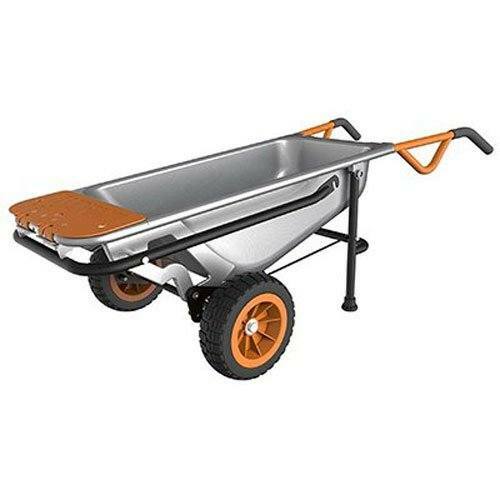 Made from durable plastic with a sturdy steel frame, this cart is strong enough to handle most domestic garden needs. Empty, it weighs just over 30lb. The full load capacity is 600lb, enough to handle most domestic gardening loads. It certainly feels strong and sturdy enough to handle anything you can throw at it for many years. 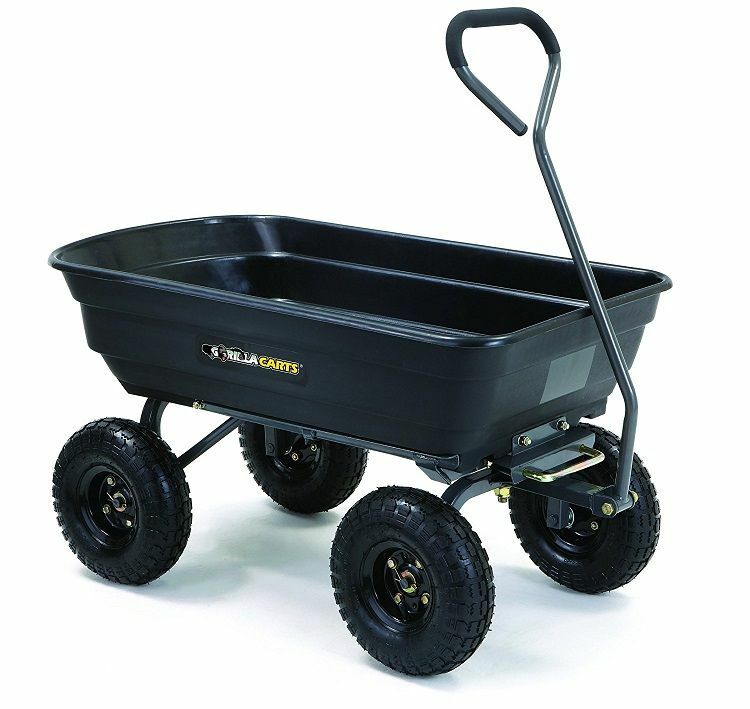 Manoeuvrability is good with this lawn cart – it's easy to both pull and turn. It’s a lot less effort than using a wheelbarrow for the same weight, as you’re not lifting the weight as well as pulling it. We find pulling a load to be easier than pushing in a wheelbarrow, especially if you’re going uphill or over soft surfaces. The GOR4PS has a dump function, allowing you to tip the body up to spill the contents out wherever you choose – similar to a dump truck, on a much smaller scale. If you plan to use the dump function, be aware there’s no hydraulic assistance, so you will be lifting the entire weight of whatever you have in the cart – this could be an issue if you’re not a professional bodybuilder and you’re planning to make full use of the 600lb capacity! This cart comes with a 1 year warranty from the manufacturer. One of the most common complaints with this cart is the smell when it’s new. We’re not sure if it comes from the body or the tyres, but there’s a definite chemical aroma when you first open the packaging up. We found the smell disappeared over the first week or 2 of use, but you’d definitely want to consider assembling it and storing it outside, or (worst case) in the garage. Certainly we’d advise not opening the packaging inside your house! The plastic body does seem to flex quite a bit, though we have seen no indications that it’s likely to break. Overall this lawn cart seems quite robust. If the 600lb capacity of the GOR4PS isn’t enough for your needs, we suggest you have a look at it’s big brother, the Gorilla Carts ﻿GOR6PS Heavy Duty 1200lb Capacity Lawn Cart. This cart really is a beast – if you have a job it can’t handle, you really need to look at commercial equipment. The GOR6PS incorporates the same improvements as the smaller model – it’s easier to assemble than the previous model was, and it also includes the quick-release tipping system. It’s not quite as manoeuvrable as the smaller model, and it weighs significantly more at 60lb unloaded. It’s also bulkier which is a nuisance both when using it and when trying to find somewhere in the shed to store it. These issues as well as the higher price suggest it’s more lawn cart than most people will ever need, and prevent us from making this model our top choice. The WORX WG050 Aerocart is pitched as a more versatile alternative – as well as a lawn cart, as supplied it can be used as a dolly for shifting furniture, refrigerators and other heavy household items, as well as a rock lifter, trailer mover, and many other functions. With available accessories, it can be converted to a snow shovel, water carrier, or firewood mover. The WG050 is quite a bit more expensive than the other lawn carts featured here, and the load capacity at 300lb is quite a bit less than the competition. The body itself is quite small & you can’t really fit much more than 1 or 2 bags of mulch in it. The Sandusky Lee CW3418 has removable folding sides, which allow it to be converted to a flatbed cart. You can either fold the sides down or just take them off altogether when you need to use it as a flatbed – the sides move about a bit when folded down, and clash with the wheels. Long-term user feedback suggests it’s better to just take the sides off. This cart is made of steel with a mesh bed which allows moisture to drain. It isn’t stainless steel so it will rust eventually if you leave it outside in all weathers. 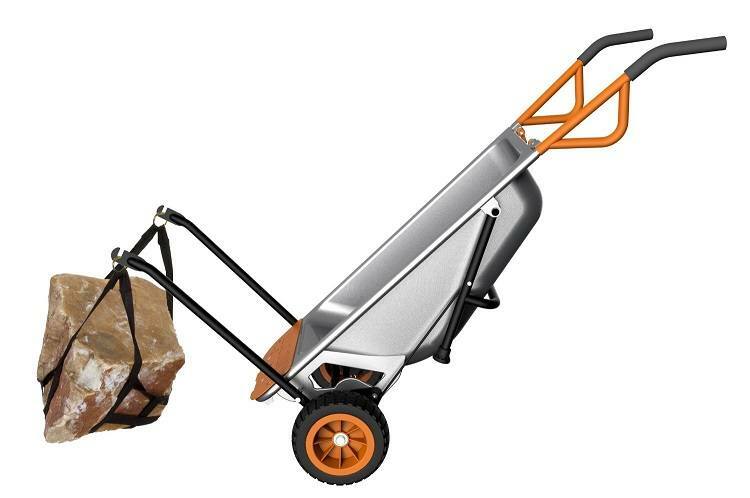 The 400lb capacity should allow you to carry most loads around your garden – bags of soil, compost, much, cement etc. are no problem. 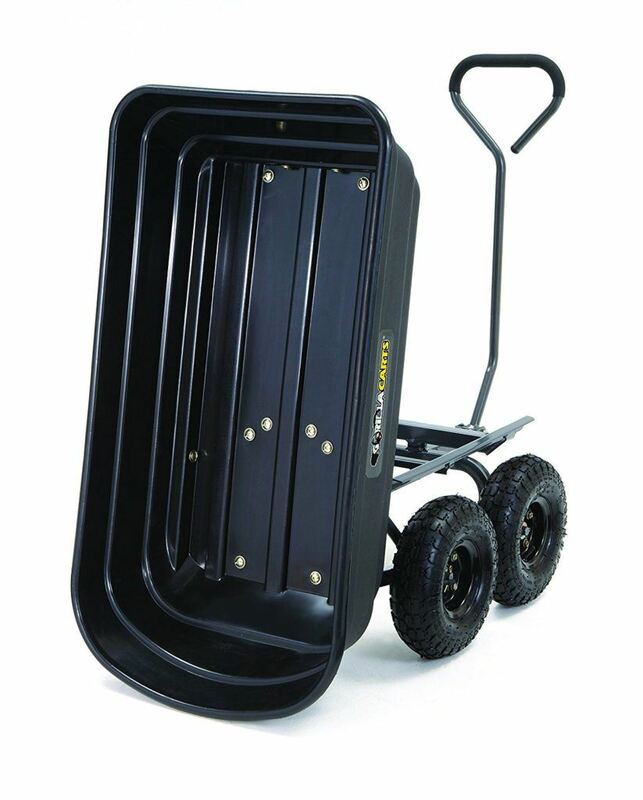 If you need a heavier-capacity cart with folding sides, there are options such as this one from Gorilla Carts. The padded straight handle is comfortable to pull in operation, this cart is quite manoeuvrable & pulls and turns with little resistance. The 10” tires will get you over most surfaces. The instructions provided with this cart aren’t as good as some others, the English translation is quite poor. That said, assembly is quite simple. Once you have figured out which piece goes where you should have no problem. The Suncast LC1250D﻿﻿ Lawn Cart is appropriate for transporting and storing mulch, outdoor items and dirt. It is made from resin for extra durability. It has a 15.5 gallon capacity for strain reduction, and the whole cart weighs in at just 11lb. This model is generally user-friendly, lightweight and has a telescoping handle which disappears into the body when you’re not using it. 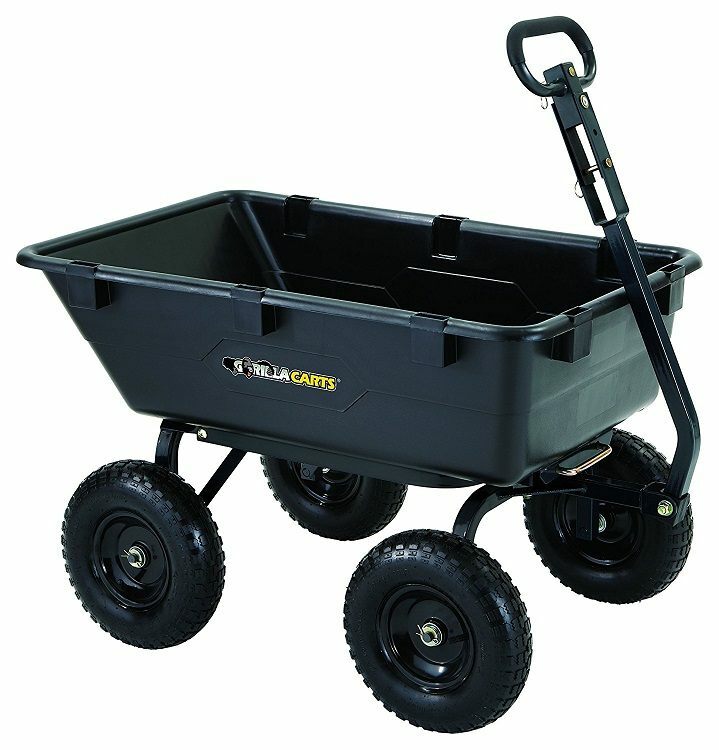 This lawn cart has 7”wheels with a metal axle. We found it easy to manoeuver on pretty much any type of surface. Some assembly is required, however this just consists of attaching the handle to the body with 2 screws. 5 minutes and you're ready to go. If our first choice is unavailable, you could consider the SKY2387 Best Choice Products 650LB Garden Dump Cart. At first glance, the specifications seem similar to the Gorilla Carts GOR4PS; however the reviews aren’t great, with users pointing out a note included with the cart states the true weight capacity is 440lb, not the advertised 650lb. Additionally, the assembly instructions are truly awful. Check all nuts & bolts are tightened correctly before using your lawn cart to transport any loads. Make sure the tires are inflated to the manufacturer’s specified pressure, and inspect the cart for any visible damage. Make sure you follow any specific instructions from the manufacturer to keep your warranty valid, and more importantly to avoid accident and injury. After using your cart, clean it with a hose and / or stiff-bristled brush (depending on what you’ve been using the cart for). If you want it to last for many seasons, store your lawn cart in a shed or garage when you’re not using it. If that’s not possible, at least try to find somewhere to keep it out of the rain. Some of the carts have a noticeable odour when they’re new – if this applies to your cart it’s best to keep it outside for at least the first 1-2 weeks. We recommend the G﻿﻿orilla Carts ﻿GOR4PS as the best lawn cart. It’s reasonably priced, strong and manoeuvrable. The plastic body & steel frame should last you for many seasons. Do you own any of these lawn carts, or did you choose another model? Let us know in the comments below!